I am originally from San Diego, CA, where I spent most of my life at the relaxed pace of living the beach lifestyle. Surfing, waterskiing, skateboarding and riding bicycles in the warm sun were just a way of life. Always up for an adventure, I moved up the coast to Los Angeles were I helped to create an independent film company. After a few years, I heard a call from the north and moved up to San Francisco. It was in the bay area that I became a dessert enthusiast and started performing music and comedy. I realized that all I wanted to do in life is make people happy. I made another move up north to Seattle where I immersed myself in the good food and music provided by the Northwest. Here, I found myself with my first wedding industry job. Designing, distributing and selling wedding themes single-use cameras. Remember those? 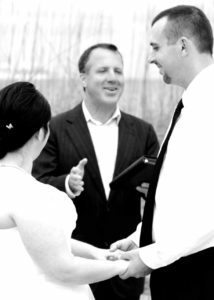 I was immediately drawn to the hospitality and fun of weddings and that’s when I decided to become an ordained minister and I started performing wedding ceremonies. ~Thank you again for being part of our Wedding Day; we could not have asked for a more beautiful beach wedding, thoughtful service, amazing pictures and finally an amazing evening with friends and family who traveled from all over the US, Europe, and even Chile to share in our happiness. 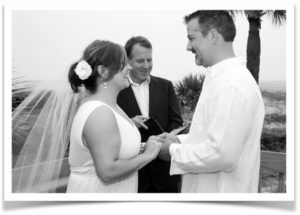 You made all of this seamless and your recommendations from our first phone conversation to our last helped to make our day PERFECT! ~Hello Stephen. Cameron and I wanted to thank you for the absolutely beautiful ceremony. You were wonderful to work with and made us and everyone else feel very at ease. We appreciate your kind words and will forever cherish that moment. We definitely will be recommending you!!! I had to tell you ASAP that you won The Knot 2018 Best of Weddings!! I am so excited for you—congratulations! Your win was in the Officiants & Premarital Counseling category! You were the only one in Savannah who won!! ~Thank you so much! Words can't express how perfect you made our day!! Thank you for everything!!!! ~ Thank you so much for everything, that feels inadequate to say since you were such an important part of our day, but thank you nonetheless. Our wedding day was so much more than I imagined it could be and you were really so helpful and wonderful throughout the whole process. We took such a risk planning so much of our wedding over the internet but are so pleased with how everything turned out. I am shouting your praises from the rooftop and, if at all possible, will try to convince more of my friends and people to utilize your services. ~ Thank you!! We are so very happy and had a wonderful time in Georgia. From the beautiful site selection to your seamless delivery and coordination of the ceremony, you made our special day truly spectacular and we are forever grateful. ~ Our vow renewal was more than either one of us expected...... we've talked about it so many times since that day. I can't believe I'm saying this, but this one seemed even more perfect than the first. The hands ceremony will be one of my favorite moments that I will carry forward on the rest of my journey. The words were perfect, and meant even more standing there holding the hands of the one we love the most. Thank you for being a part of it, and you can bet we know just who to call when we hit the big 30! ~ Stephen was wonderful! The ceremony was beautiful and he even brought some humor to it, which is always nice! ~ Stephen officiated at our wedding in Savannah this past weekend. The ceremony was simple and meaningful. Everything moved at the perfect pace. We wrote our own vows, and also had him lead a sand unity ceremony. He also incorporated my two children (8 & 13) in the wedding without making them uncomfortable in the spotlight. Our wedding could not have been more perfect! ~ Stephen was absolutely wonderful to work with! He was very easy to communicate with and always replied almost immediately to our emails. He was professional, friendly, positive, prompt, and did a wonderful job as officiant for our wedding! We would highly recommend his services to others!!! “Stephen - You really did an amazing job with our ceremony...it was just what we wanted!!! We also hope to run into you again on Tybee. We are out there quite a bit all year long. We are so blessed that everything worked out so well on Sunday!!! ~ Thank you so much Stephen – we keep saying to each other “are we really married?” I took the application back to the county and pick up our certified copies so as of today I can really say we are married. Everyone loved the ceremony and kept saying how personalized it was but we assured them until Saturday we had not met you. Once again thanks so much. ~ We wanted a completely non-religious ceremony, at sunrise, on the beach, with a child involved, in a week. We wrote our own vows. And yet, Stephen added so much. It was beautiful and intimate and everything I could have wanted. He incorporated everything we wanted, then added things, adjusting as he went, to us and the surrounding. His voice was so expressive and added meaning to words we have all heard so often. At the end he just started taking pictures with the iPad. I recommend him highly!